I like to keep a few beauty essentials with me at all times and Green People's travel sized items are perfect for saving space in your handbag. I've been trying out the Cooling Hydrating Mist* and Soft Lips balm*. A hydrating lip product is a must have for any handbag. Soft Lips contains coconut oil, berry wax and cupuacu butter which all help to nourish and condition your lips while also adding a natural glossy sheen. I pop a bit of Carmex on my lips before bed and having been reaching for the Soft Lips balm during the day. 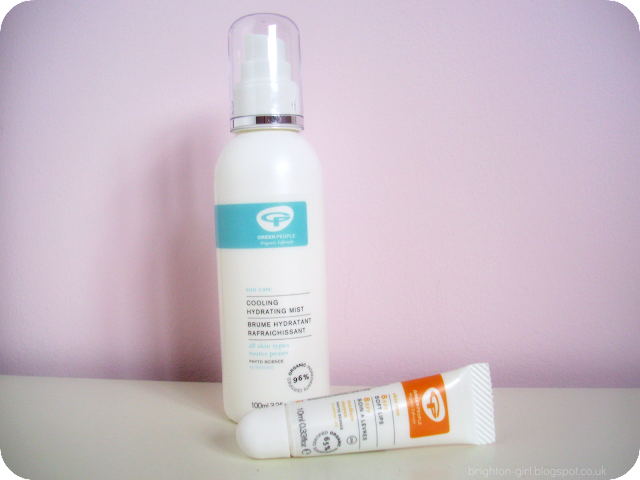 It also provides SPF8 UV protection which is great for when you're out and about. The Cooling Hydrating Mist is a fantastic multi-use product. I've been loving using it as an everyday toner. It tightens my pores but feels refreshing too. It smells fresh and lightly floral as it contains both orange blossom and rose water. I struggle with anxiety and can get a bit flustered when I'm out so the Cooling Hydrating Mist is ideal for calming my skin down when I'm on the go. The mist will be great for using in the summer as you can keep it in the fridge for a cooling spritz. My Mum also pointed out that it would be a welcome addition for any women currently suffering from hot flushes. With so many uses, this is proving to be a must have travel essential! Green People are committed to creating natural and organic beauty products that actually work. I really admire their ethics and am yet to be disappointed by any of their products. Their travel size items are proof indeed that good things come in small packages! Really need to look into green people, it sounds great!